9 members of the walking group met on New Year's Eve, to follow the 'Treasure Hunt' organised by Sue.. We had a very interesting and searching walk around Lostwithiel, finding answers to numerous clues about plaques, stones, memorials we pass by each time we are in the town or Coulson Park. We finished the walk by the river and were invited to Sue's home to enjoy warm mince pies, clotted cream and hot drinks. Thank you for your hospitality. Due to numerous events linked to the festive season, several regular walkers were unable to join this walk, however 2 new people joined the group, making a group of 6. The walk was led by Reuben and started from Borough Arms at Dunmere, and followed the Camel trail. The mild, dry weather and the beautiful autumnal colours made this walk especially enjoyable. Several members of the group expressed how they had enjoyed the walk and having the opportunity to meet new people and enjoy walking in company. The walk was organised by Alan and Marion May and started from the decorated bus shelter in Fowey. We walk down a track to Readymoney cove, then up a stairway from the beach to the woods. 3 members of the group went to look at St. Catherine's castle, whilst the rest of the group admired the view across to Polruan and up the estuary . We decided not to take the coastal path across Alldays field, as heavy rain from the previous few days meant the track could be slippy. Having crossed the fields we walk past Combe Farm, then down to Polridmouth beach for our picnic lunch..where we were joined by a few hungry ducks! Our return to Fowey was via Combe farm, then down the lanes and across a muddy field and through a small wood. Several members of the group having lived in Lostwithiel for many years had not visited Polridmouth beach, and had enjoyed the walk, expressing the value of walking with a group as often you go to new places or by different routes. 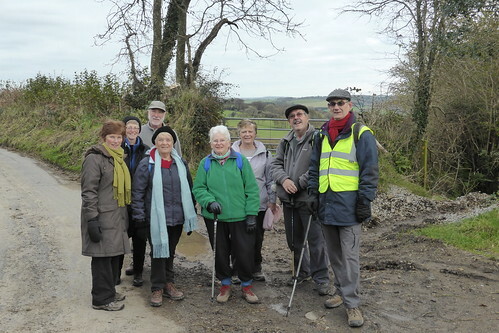 The walk had been organised by Barbara Dixon. 11 members of U3a meet up and left Lostwithiel by train to start a walk from Bodmin Parkway, through the woods of Lanhydrock, then onto Restormel Road, past Restormel Manor and then back to Lostwithiel. 8 people met at the communnity centre, from there we drove to St Mawgan, parked cars and headed towards Mawgan Porth. Reuben has researched the points of interest on the walk and we were told interesting facts about the local church yard, farm buildings and views along the way. The walk passed through wooded areas as well as open spaces with stunning views across the valley with glimpses of the sea. We arrived at Mawgan Porth in time for lunch which we had whilst sitting on the beach. Our return was on a different path and other side of the stream, we passed through avenues of trees and back through the village. At the end of the walk we all enjoyed a cup of tea, cakes and soup at the tea rooms behind the Post Office in St. Mawgan.